Being a busy woman with a hectic lifestyle and a demanding or growing business is not always easy. Don’t I know! So many things can drop to the bottom of your to-do list. And even when you’ve decided that you want — or need — to blog more to become more visible, there is usually something more urgent to do first. How do you remember to exercise or go to the gym? Does remembering take much effort? Probably not, if exercising is part of your daily or weekly routine, as much as cleaning your teeth, for example. Often, the habitual things we do take the least effort, as do the activities that have a firm place in your busy schedule. But any new or out-of-the-ordinary activities can be much harder to integrate into an existing routine. Blogging is a good example of that. Maybe you’ve written a few blogs to populate your website, but then you just stopped or got distracted by other business-building activities. Maybe you think that you will blog more when you have time. Which in reality never seems to happen. If that mind-set sounds familiar, how can you remember to blog? I suggest you stop thinking of blogging as something that you’ll only do when you can. You need to give it a lot more importance than that — after all, blogging sits at the core of all your social media activities. You want to give it a similar status to some of your other marketing activities, such as networking or speaking. (If you’re not sure why blogging is so important, please also read why blogging attracts new customers. So when you add blogging to your to-do list, put it right next to your other priorities. That way it becomes a task you ‘see’ often and can tick off accordingly. I always find that quite rewarding! Many busy people try to cram far too many things into their day in the vain hope that they can manage them all. But if you frequently feel stressed or overwhelmed by the size of your workload, perhaps you ought to ask yourself whether you often take on things you shouldn’t? Have a think about all the stuff that keeps you busy. I bet you’ll notice that not everything that appears important actually is. There is bound to be something you can do less often, or even drop altogether. Saying no in this instance will free you to say yes to something important like blogging. Which is a very good choice to make! By letting blogging become a regular activity, you are creating consistency and a new habit; this is not unlike starting to exercise when you previously led a sedate lifestyle! One of the easiest ways to remember to blog is to put a dedicated writing slot into your diary. It doesn’t matter whether you plan to write once a week or once a month; by planning ahead this way, you treat blogging like an important appointment. Whilst this may only be an appointment with yourself, it will remind you not to book something else in during that time. For example, let’s imagine you managed to attract more clients. More clients will lead to more money. What will the money allow you to do, that you currently can’t afford? Whatever that is, write it all down and then think of a visual reminder that represents that — the ultimate result of all your effort. It could be a photo, a saying, one of your own drawings or a meaningful memento from a holiday. Perhaps you could put this near your desk or the place where you write? Alternatively you could use the image or words as a screensaver on your computer that pops up now and again. You may not see or notice it all the time, but it can be just as effective as a subconscious reminder. 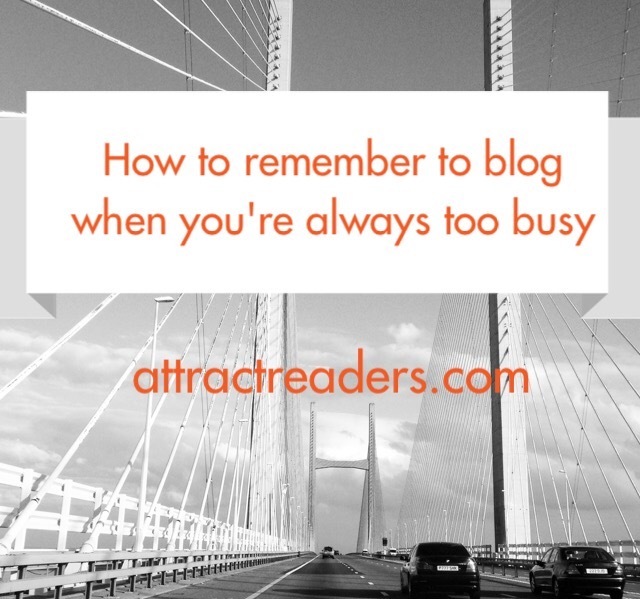 I hope I’ve given you some useful ideas about how to remind yourself to blog. How about using the coming month to try out one or two of the above mentioned techniques? Sometimes you need to experiment a little with different strategies until you find one that works for you. After all, everyone is different! PS And if you'd like some more tips like this, please also read 6 ways to make blogging easier and more enjoyable.